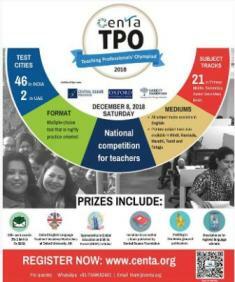 CENTA TPO 2018 will be held on December 8, 2018 Saturday. Registration closes on November 26, 2018! Each Reliance Foundation Teacher Award will include a cash prize (see below), a Jio phone and a citation. *In case you are eligible for two cash awards, on account of your participation in the same subject track, you will receive only the higher one and not both. **Reliance Foundation Teacher Awards are applicable only to winners participating in India. Date: December 8th, 2018 (Saturday). The test is conducted in three time slots. * We allocate your preferred time slot on best effort basis. Register early to get the venue and time slot of your preference. However, some of the Subject Tracks may not be available in all the time slots (details in the registration form). Registration fee: Rs 590 (inclusive of GST) per Subject Track. (You can register for up to three tracks). Two-hour, multiple choice test, only one correct answer, no negative marking. Competencies tested are based on the CENTA Standards. Only a sub-set of competencies are tested as explained in the Syllabus document. Computer-based but with a very simple interface – knowledge of computers is not required. Registration closes on November 26, 2018!